Thanks to the surprise popularity of Macross Frontier, the Macross franchise has been riding a wave of popularity for the last five years. However, as popular as Macross Frontier is, the longest series in the franchise was 1994's Macross 7 (52 episodes, a movie, and an OVA). So this year, as part of Macross' 30th anniversary, a movie crossover between the two series was released this past weekend in Japan. But what comes out of this is far from your standard crossover film; rather it's perhaps the most meta clip show ever devised. Whether it's good or not, however, is something altogether different. As with every Macross iteration, the music in FB7 is excellent. Nearly every single Fire Bomber (the protagonists' fictional rock group) single from the series is played at some point. And if there is one good point about Macross 7, it is the soundtrack. As a treat to fans of the series, there is also the debut of a new Fire Bomber song—which is always a treat as the group is purely fictional (aside from when the voices behind the characters come together and hold a concert every five years or so). For fans of Frontier, on the other hand, comes a cover medley of Fire Bomber songs sung by Frontier's singing pair Ranka Lee and Sheryl Nome. It's quite well done and will definitely keep fans of Frontier happy. watching "archival footage," they are not having memories of 7 beamed into their heads. 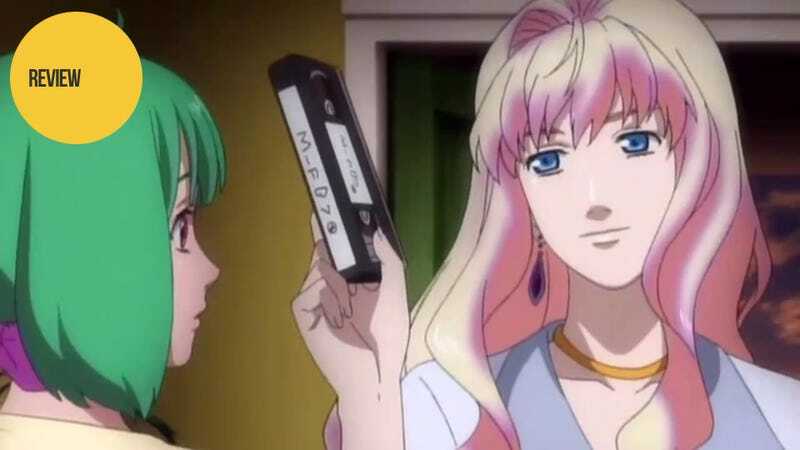 No, they are watching the physical VHS tapes of the real world's Macross 7 TV series—complete with "to be continued" at the end of each episode. And as it is never explained how these tapes came to be—and as no one knows what happened to the Macross 7 fleet and thus no one could have made or filmed it—the entire premise makes no sense whatsoever. Oh sure, the space bird that magically delivers them a tape each time they finish one is explained but not how these tapes exist in the first place. Still, having the Frontier characters learn the "power of rock" does give a few of them a little extra character development as well as a few generally funny scenes. As an anime, Macross 7 dragged horribly and would be downright boring for episodes at a time. So, in theory, cramming the entire plot into a 90-minute clip show might actually improve it. Next week marks the release of Macross 7 remastered on Blu Ray. Thus as a good 80% of FB7 comes from remastered Macross 7 footage, it seems like the creators simply made this movie to pitch the box set. Moreover, because the newest generation of fans has likely never seen any Macross except Macross Frontier, this can also be viewed as an appeal to these fans. After all, if the cast of Frontier loved watching Macross 7, so will you! The purpose of FB7 is to tell people about Macross 7—both the viewers of the film and the characters in the movie's story. For us in the real world, it seems to be nothing but a commercial for a classic 90's anime, but for the Frontier characters, it's an inspirational tale of a forgotten hero who saved the human race through the power of rock and roll. And as they are caught in the middle of a war with a mysterious alien force themselves, it would certainly give them hope. So while I'd never call Macross FB7 a good movie—or even a movie at all for that matter—Macross fans, both old and new may get some enjoyment out of it. While it fails in many ways, it nonetheless succeeds in being a nostalgic trip for long-time fans and an interesting introduction to the greater Macross universe for new ones. Macross FB7 was released on October 20, 2012, in theaters across Japan. There are no plans for an international release.